1 oz. of Bluecoat American Gin. Add 1 oz. of the Bluecoat American Gin. 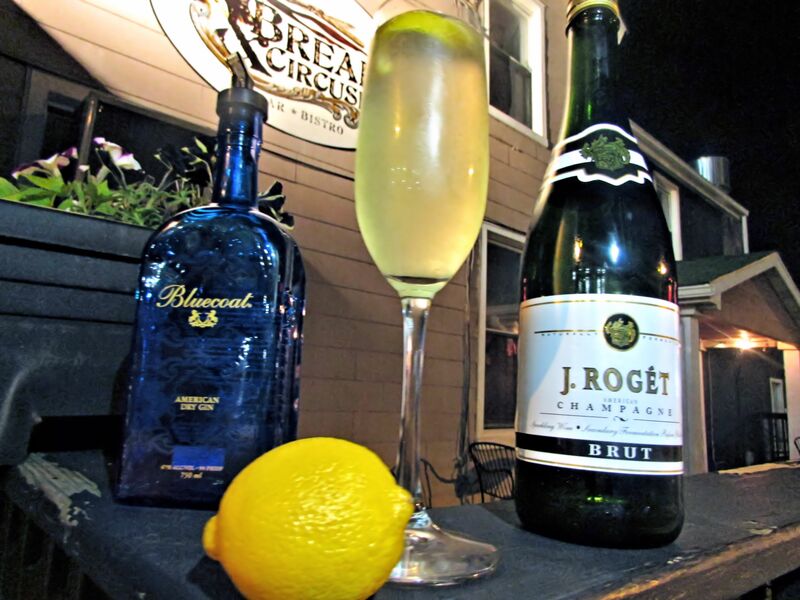 Top off cocktail with J. Roget Brut Champagne. Bread & Circuses is located in Towson, MD. Towson is the proud home of The Towson Tigers of Towson University. Towson University just received national recognition on American Ninja Warrior with Kacy Catanzaro a graduate and former gymnast of Towson University. Bread & Circuses is surrounded by establishments that cater to the Towson students. So Bread & Circuses is a breath of fresh air in Towson, since it doesn’t serve chicken wings and mozzarella sticks . Bread & Circuses has an extensive list of Signature Cocktails and if you like Scotch, you will enjoy their Scotch selection. Our bartender in this video is Demi, she has been providing her expert services to Bread & Circuses for three years. She has a sense of humor based on the bio she gave us. At the ripe old age of 22, you can find her at Johns Hopkins during the day performing brain surgery and at night time performing her bartending services at Bread & Circuses. When she retires from her stressful career as a brain surgeon, she plans to work for Sports Illustrated as a location scout and a part time model. We wish her the best in her ambitions. 2 dashes of Simple Syrup. .5 oz. of Elderflower Liquor. Add Strawberries and Simple Syrup to shaker, then muddle. Add the Rosewater and Elderflower to shaker. This is a pretty simple cocktail to make and just as easy to consume. So watch yourself with this one. It has a sweet taste with some floral tones to it. The strawberries and champagne of course do their job of subduing the floral tones. A great cocktail for the summer, but with champagne it really is a cocktail, that provides any excuse to have a cocktail. Demi our energetic and entertaining bartender from Bread and Circuses decided to be original with her bio. So here it is, after retiring from a stressful career as brain surgeon. Demi has plans to work for Sports Illustrated as a location scout and a part time model. She certainly has a sense of humor, stop in Bread and Circuses when you are in town. 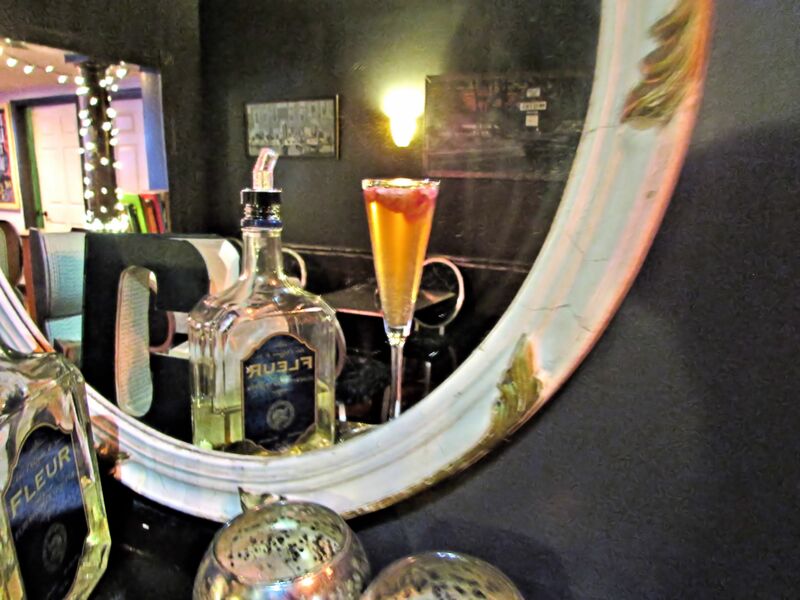 You will not be disappointed by any of their Signature Cocktails or their bartenders. 1.5 oz. of Van Gogh Vodka. .5 oz. Dimmi Liquore di Milano. Add the ingredients to a shaker in order listed above. At Anastasia you will find simple, yet elegant Italian fare served while listening to the beats of Europe’s thriving dance scene. Rare, Imported craft Italian beers on tap, fabulous regional Italian wines, and specialty cocktails inspired by exotic Italian fruits, like Sicilian Blood Oranges, crafted by Baltimore’s Best Bartender. But it doesn’t end there – Late night, dancing to the music of our live Dj ensues. Prints of Italian icons like Gia, Brando, Sophia Loren, Ferrari and Ducat. Our bartender in this video and creator of this cocktail is Carmen Motto. Carmen has been in the industry for over 15 years. She won the distinguished award of Best Bartender in Baltimore two years in a row. So one should hope she knows what she is doing. You will enjoy her company as well, she is very entertaining behind the bar. We have two Signature Cocktails, since this is for Valentines Day. The first Signature Cocktail is Anastasia’s complimentary Champagne Toast. This is not your typical Chamoagne Toast, it is not just a glass of ChampagneI. It is a Champgane cocktail perfect for a toast with your Valentine, starting with the Pama Liqueur and Pomegranate seeds to the heart shaped strawberry garnishing the glass. Then we have the Signature Cocktail “Sophia” has the floral undertones of the Dimmi di Milano Liquore that soften the taste of the vodka . The sour and cranberry adds a little tartness to the cocktail. Garnished with a Rose petal this cocktail is pure Valentines Day cocktail.